How do we do it? Well, partly it’s practice, when you do something everyday, you just get better at it. 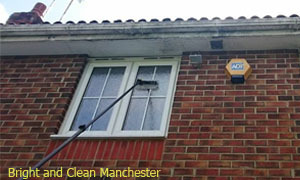 Our other secret is that we use the ideal window cleaning chemical, H2O. You might know it better as water. We don’t just use any old water though, we use purified water and that makes all the difference. Book your service 24/7: We’re at the end of the line, or available through chat any time. We’ll even contact you, leave your details on our contact form. Get a free, no-obligation quote: Know exactly what your cleaning will cost before you book. Arrange your service for any day of the week: That includes weekends when that’s what suits you and there’s no extra charge for that. Use us for all your windows: Single, double, bay, sash or skylight. Don’t forget your conservatory, we’ll do that too. Combine your window cleaning with other services: You may be offered a discount, consider carpet cleaning or even gardening services. Your cleaners bring everything they need to deliver your window cleaning services. They’ll clean just the outside when that’s all you want, or at your request they’ll do the insides too. When you have PVC frames or sills those will be cleaned along with the glass. So you get a truly smart and professional finish. Apart from our own water, ladders, squeegee and other equipment needed, we’ll also bring conventional glass cleaners. If you feel strongly about it we’ll use these too, but we’d suggest you try out our purified water only method first. Over time you’ll notice that distilled water actually sterilises the glass and makes it more difficult for fresh dirt to stick, so your windows will actually stay cleaner for longer. For your security, all of our window cleaners are CRB vetted and ID verified before being accepted onto our team. 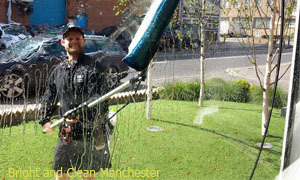 We provide a period of initial training before sending them out on any window cleaning work. Our training program covers both the techniques of effective window cleaning and also the standards of customer care we work to. Expect your cleaners to arrive on schedule, and to behave in a courteous, friendly and professional manner throughout the time they’re with you. Your service is delivered under full insurance and we also maintain a quality monitoring system just to make sure that you get the quality of work and attention to detail you deserve.